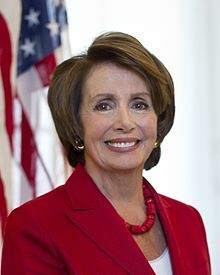 Nancy Patricia D'Alesandro Pelosi (/pÉ™ËˆloÊŠsi/; born March 26, 1940) is an American politician serving as the Minority Leader of the United States House of Representatives since 2011, representing most of San Francisco, California. She previously served as the 52nd House Speaker from 2007 to 2011, the only woman to do so. A member of the Democratic Party, Pelosi represents California's 12th congressional district which consists of four-fifths of the city and county of San Francisco. She served as the House Minority Whip from 2002 to 2003, and was House Minority Leader from 2003 to 2007.